This is a magic trick, really. Candy corn transforms into Butterfinger-flavored goo that coats popcorn. A touch of milk chocolate and the trick is a success! I don’t know how or why it happens, but it does. 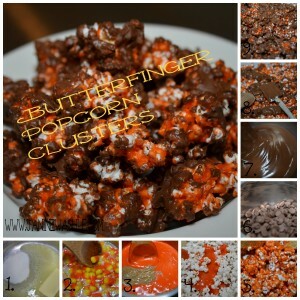 Melted candy corn mixed with peanut butter equals Butterfinger. Let’s not try to overthink it; it’s magic. Melt together butter and sugar in a medium saucepan set over medium heat. Once sugar has melted, add candy corn and salt. Stirring constantly, melt the candy corn into the butter, about 4 minutes. Stir in peanut butter. Cook another minute or so until the peanut butter is smoothly incorporated. Pour popcorn into a deep wide bowl. 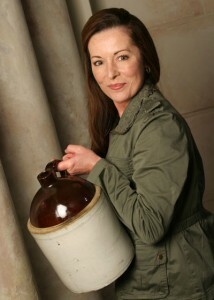 I used a heavy pot with those dimensions. 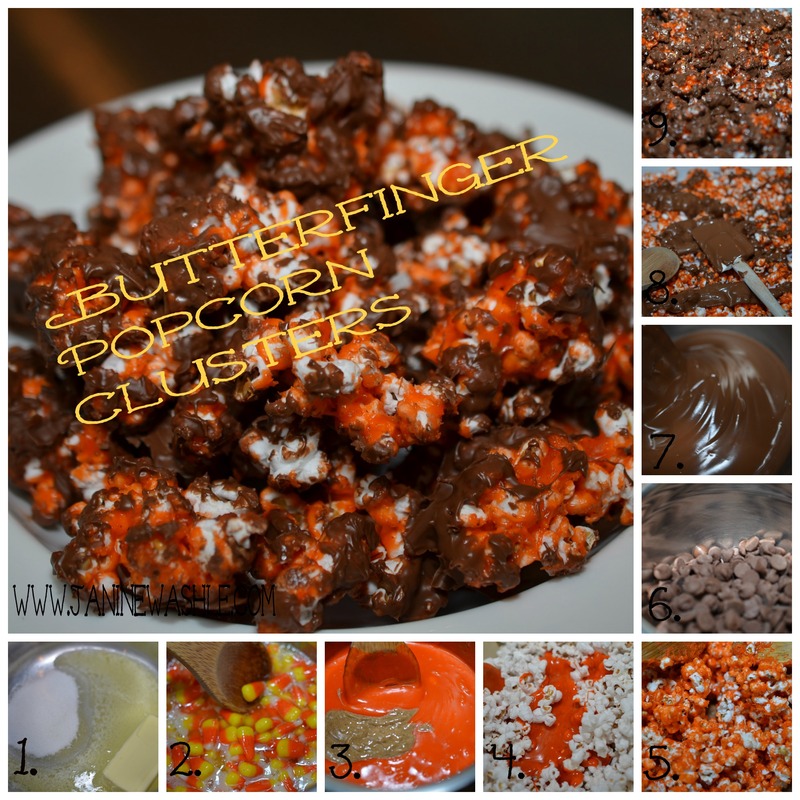 Once the candy corn, now butterfinger, mixture is ready, immediately pour over popcorn. Using 2 wooden spoons, toss and mix about to coat as much popcorn with the mixture. Dump onto a parchment lined baking sheet. Break into bite-size clusters. Set aside. In a double boiler, melt milk chocolate chips. Once melted drizzle/pour all over the clusters. Set aside to harden. You can rush this by placing pan in the freezer for 10 minutes. Once chocolate has set, transfer to bags if giving away, or into a bowl for snacking. NOTE: Don't add the peanut butter nor use the chocolate and you have candy corn popcorn. No magic there though.